NewWayToWork. 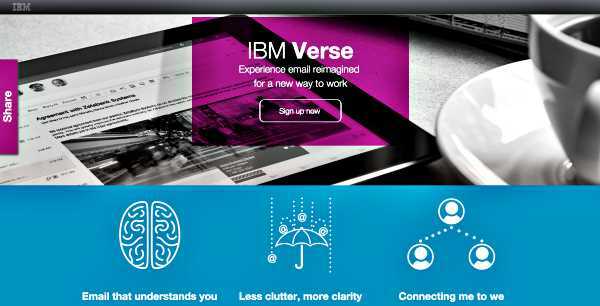 The highly anticipated IBM verse email client aiming to accelerate social business transformation and drive social collaboration is close to launch. Watch those 6 videos. IBM Social Business has just published a series of YouTube videos. Those six videos highlight some of the key features of IBM’s new approach to email management coupled with social collaboration, IBM Verse. You will find below the IBM verse videos from the IBM Social Business youtube channel. IBM Verse: How do you track your actions? IBM Verse: How do you track what you are waiting for? IBM Verse: How do you know whats next? IBM Verse: How do you prepare? IBM Verse: How do you share? IBM Verse: How do you search? How much time do you waste every day at work on trying to manage your emails and keep track of actions agreed (or not) with your colleagues and clients? I personally very much look forward to trying out IBM Verse: I truly believe this new way to work might very well help me, my colleagues and you to save time every day, foster collaboration and accelerate social business transformation at your organisation.